The release of this draft Hanging Lake management decision initiates a 45-day objections period. Any individual or agency that submitted comments during the scoping and/or comment period will have eligibility to file an objection to the draft decision notice under 36 CFR 218. Documents are available for download on the White River National Forest website. 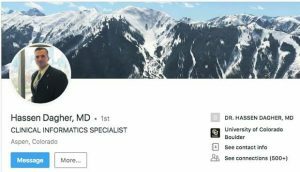 Hard copies may be reviewed at the Eagle-Holy Cross Ranger District, in Minturn, Colo. Objections, including attachments, must be filed via mail, fax, email, hand-delivery, express delivery or messenger service (Monday through Friday, 8 a.m. to 4:30 p.m., excluding holidays) to: Reviewing Officer, c/o USDA Forest Service, Region 2, Rocky Mountain Region, Attn. Objection Reviewing Officer-Planning Department, 1617 Cole Boulevard, Building 17, Lakewood, Colo. 80401. Fax: 303-275-5134, or email to r02admin_review@fs.fed.us . Objections must be submitted within 45 calendar days following the publication of a legal notice in the Vail Daily newspaper on Feb. 20, 2018. The U.S. Forest Service has released its draft decision to adopt and implement a plan to manage crowds at the popular yet overused Hanging Lake Trail area in Glenwood Canyon. The decision is still subject to a formal objection process, and comes after an environmental assessment issued late last year concluded that a management plan limiting daily visits and implementing a permit system would preserve Hanging Lake’s fragile ecosystem. Tuesday’s draft decision sets in motion a plan to limit daily year-round capacity to 615 visitors per day, and would establish a fee-based reservation and permit system. A shuttle service to and from the trailhead would be used during the peak season from May 1 through Oct. 31, eliminating parking problems at the site. It also implements what’s called an “adaptive management strategy,” which allows for adjustments to the management plan as deemed appropriate, and “ensures that the intent of the plan continues to be realized in light of potential future changes,” according to Forest Service officials. The management decision is based on multiple years of analysis and public input, and is in response to the overwhelming growth in visitation to the site. Mayville noted that Hanging Lake has become one of Colorado’s “bucket list and must-do” hikes for visitors from all over the world. 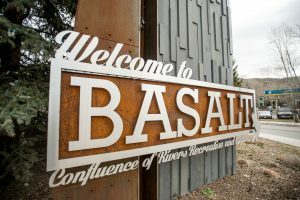 With upward of 1,000 or more visitors a day, not only has it caused parking problems at the trailhead, the main concern has been for impacts on the natural environment and geological composition of the lake feature. Hanging Lake is “a large and rare example of a travertine deposition lake and hanging garden plant community,” the Forest Service notes in its decision. High-use visitation at Hanging Lake over the past decade has resulted in damage to the area’s sensitive vegetation, historic resources and infrastructure within the area. In recent years, the area has also been the target of vandalism and abuse of rules, such as no dogs on the trail and no wading into the water or out onto a log that lies across the lake’s surface. 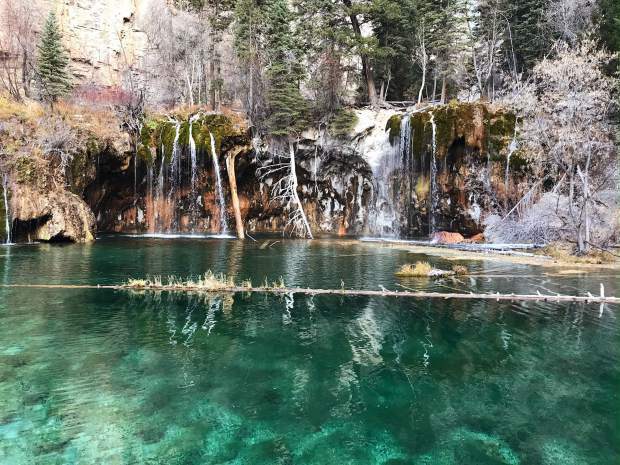 The management plan seeks to balance the preservation of Hanging Lake’s unique natural resources, manage congestion, improve visitor experience, and support local tourism, according to forest officials. Following a 45-day objection period, a final decision is expected to be released and a process begun to identify a third-party shuttle service provider and a vendor to handle permits. The Forest Service hopes to implement the new management plan this year. 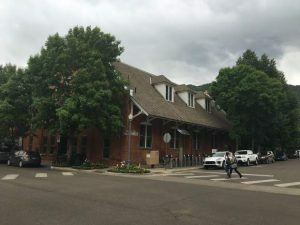 Businesses may submit proposals through a Forest Service Outfitter and Guide special-use permit process that includes transportation, a reservation system, and visitor services, according to the management plan. After the prospectus application window is closed, the Forest Service will evaluate the proposals and make a decision on the third-party transportation provider based on requirements identified in the prospectus. Details such as permit fees, timing and how to obtain a permit/reservation will be determined by whatever option and/or service provider is selected.